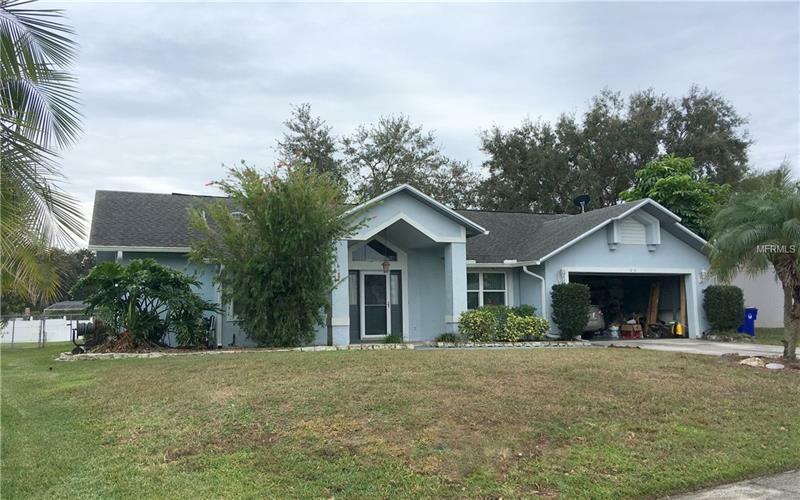 Beautiful 4-bedroom 2-bath pool home in popular Canoe Creek Woods. Enter the wide front door to formal living room on the right and formal dining room on the left. Vaulted ceilings add a spacious atmosphere. The kitchen features granite counters with peninsula snack bar, lots of oak cabinetry with corner Lazy Susan to keep things organized, glass tile backsplash and closet pantry. There is room for a dining room table and hutch in the dinette adjacent to the kitchen, all open to the family room, perfect for get-togethers. From the family room sliding glass doors, exit to the pool deck, with lanai roof protecting your patio furniture. The pool is fully screen enclosed, pool refinished in 2017. Back inside, the master suite has a window to the pool for a calming view, walk-in closet, and private bath with garden tub, step-in shower, double vessel sinks and granite counter. There are three more bedrooms which share the second full bath. Oversize 2-car garage has new AO Smith hybrid 50-gal hot water heater, storage cabinets and new epoxy-finish floor. 4-ton 15-seer HVAC system installed in 2017, Energy-Star windows in 2018, seamless roof gutters in 2016. Newly reconditioned sprinkler system in front yard. On septic system to save you money on your water bill. Fully fenced back yard with shed. Check out this well-maintained home. You will be glad you did!